Benjamin Graham taught that Intelligent Investors must do a thorough fundamental analysis of investment opportunities to determine their intrinsic value and inherent risk. This is best done by utilizing a systematic approach to analysis that will provide investors with a sense of how a specific company compares to another company or by reviewing the 10 Most Undervalued Companies for the Defensive Investor – September 2015. By using the ModernGraham method one can review a company’s historical accomplishments and determine an intrinsic value that can be compared across industries. 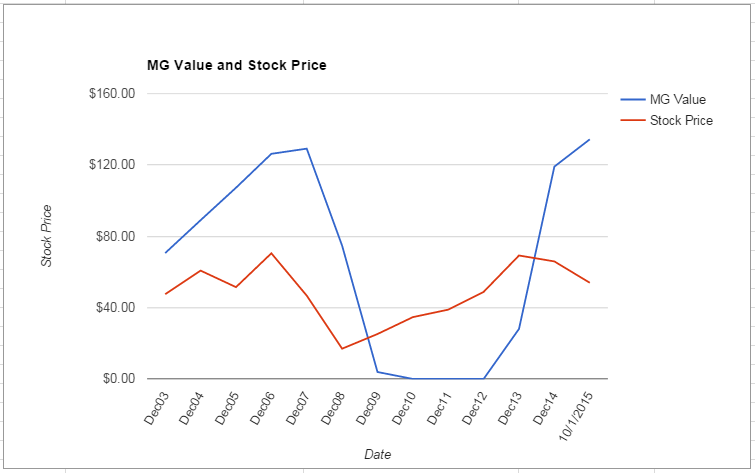 What follows is a stock analysis showing a specific look at how Harley-Davidson Inc. (HOG) fares in the ModernGraham valuation model. Company Profile (obtained from Google Finance): Harley-Davidson, Inc. is the parent company for the groups of companies doing business as Harley-Davidson Motor Company (HDMC) and Harley-Davidson Financial Services (HDFS). The Company operates in two segments: the Motorcycles & Related Products (Motorcycles) segment and the Financial Services segment. The Motorcycles segment consists of HDMC, which designs, manufactures and sells street-legal Harley-Davidson motorcycles, as well as a line of motorcycle parts, accessories, general merchandise and related services. The Company’s products are sold to retail customers through a network of independent dealers. The Financial Services segment consists of HDFS, which provides wholesale and retail financing, and insurance and insurance-related programs to Harley-Davidson dealers and their retail customers. The Company conducts its business around the world, including in North America, Europe, the Middle East and Africa (EMEA); Asia-Pacific, and Latin America. 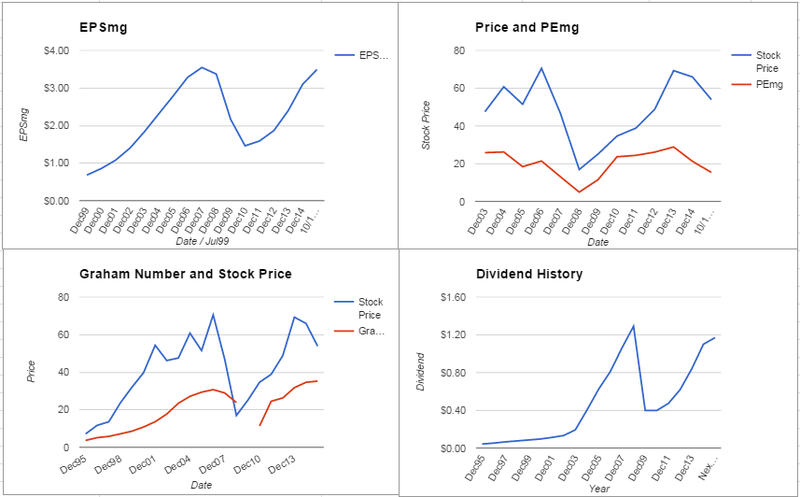 Harley-Davidson Inc. qualifies for the Enterprising Investor but not the more conservative Defensive Investor. The Defensive Investor is concerned with the insufficient earnings stability or growth over the last ten years, the low current ratio, and the high PB ratio. The Enterprising Investor is only initially concerned by the level of debt relative to the net current assets. As a result, all Enterprising Investors following the ModernGraham approach based on Benjamin Graham’s methods should feel comfortable proceeding with further research into the company. As for a valuation, the company appears to be undervalued after growing its EPSmg (normalized earnings) from $1.59 in 2011 to an estimated $3.49 for 2015. This level of demonstrated earnings growth outpaces the market’s implied estimate of 3.47% annual earnings growth over the next 7-10 years. As a result, the ModernGraham valuation model, based on Benjamin Graham’s formula, returns an estimate of intrinsic value above the price. The next part of the analysis is up to individual investors, and requires discussion of the company’s prospects. What do you think? What value would you put on Harley-Davidson Inc. (HOG)? Where do you see the company going in the future? Is there a company you like better? Leave a comment on our Facebook page or mention @ModernGraham on Twitter to discuss.